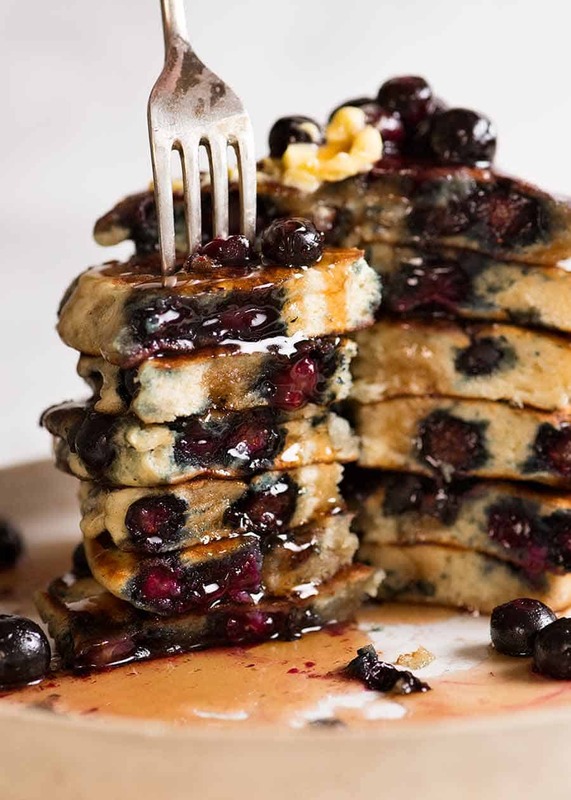 That moment when you bite into a soft fluffy Blueberry Pancake and a warm blueberry bursts in your mouth…. Hands down, one of the greatest food experiences known to man kind! Extra fluffy is the go here, and the secret is vinegar. You can’t taste it, but it activates the rising agent to give the pancakes extra lift. And don’t forget, blueberries are good for you! 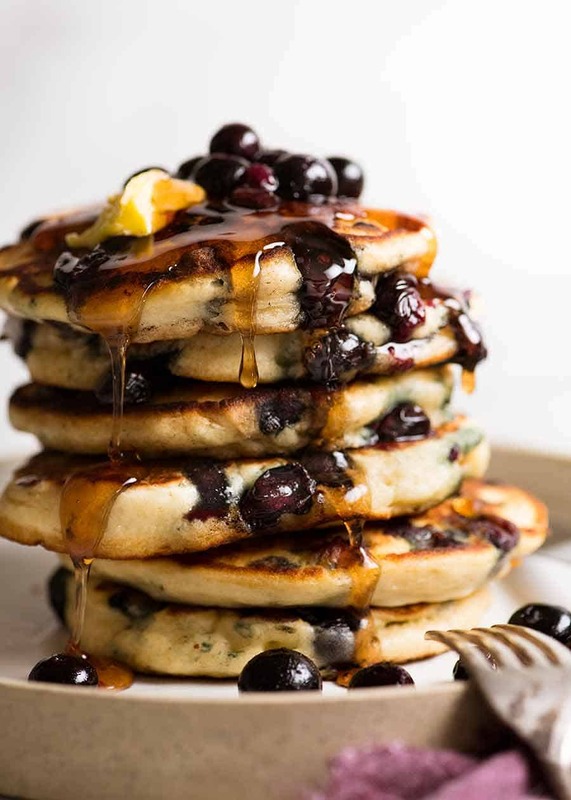 Extra fluffy Blueberry Pancakes – worth waking up for! Soft and fluffy on the inside, soaked through with maple syrup and melted butter. It’s just a little bit of food heaven right there. Plain fluffy pancakes only require flour, baking powder, sugar, vanilla, milk and an egg. 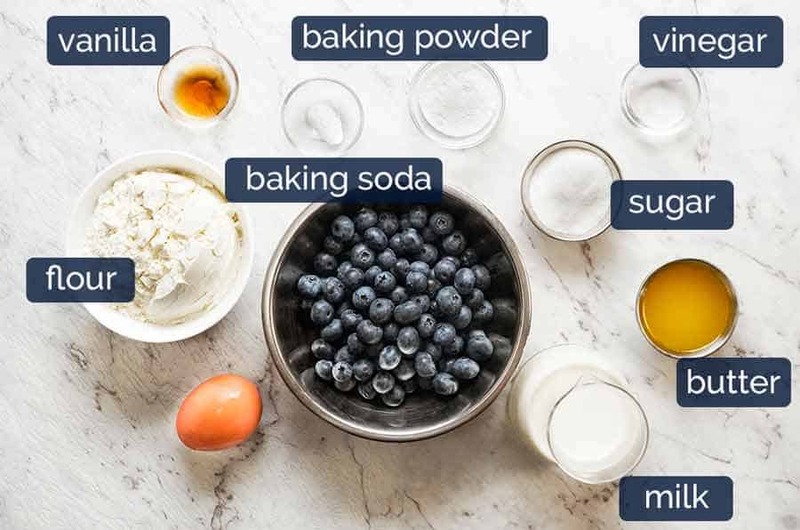 But to make fluffy blueberry pancakes, we need to give the pancakes an extra rising boost because the blueberries kind of “weighs down” the batter a bit. Especially if you use frozen ones. 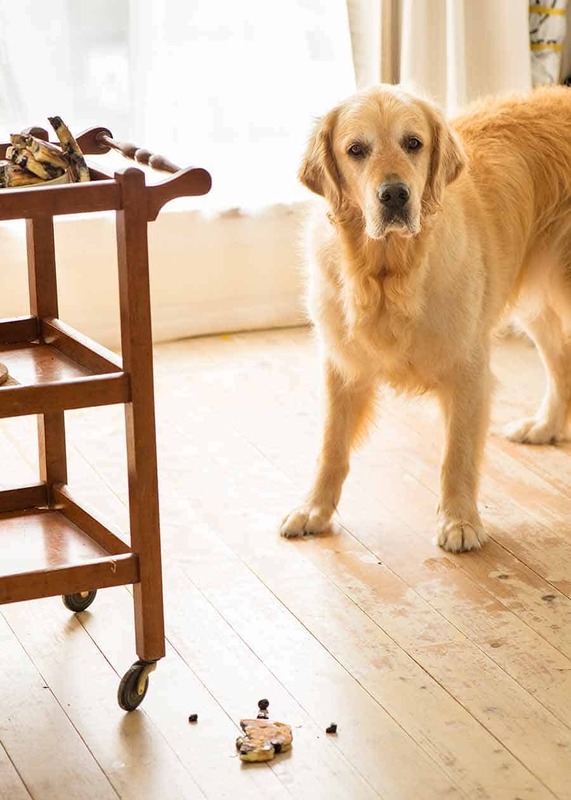 The Fluff Boosters we’re using here are baking soda and vinegar. Baking soda (also known as bi carbonate soda) is basically baking powder on steroids – it’s about 3 times as strong. It’s sold alongside baking powder at the grocery store. The vinegar activates the baking soda – gives it a kick start. Don’t worry, you can’t taste the vinegar! (PS Buttermilk has the same effect – but I always make these with milk and vinegar because I always have them and it’s cheaper). Whisk dry ingredients (flour, baking powder and soda, salt and sugar). Add wet (butter, egg, milk, vanilla, vinegar). 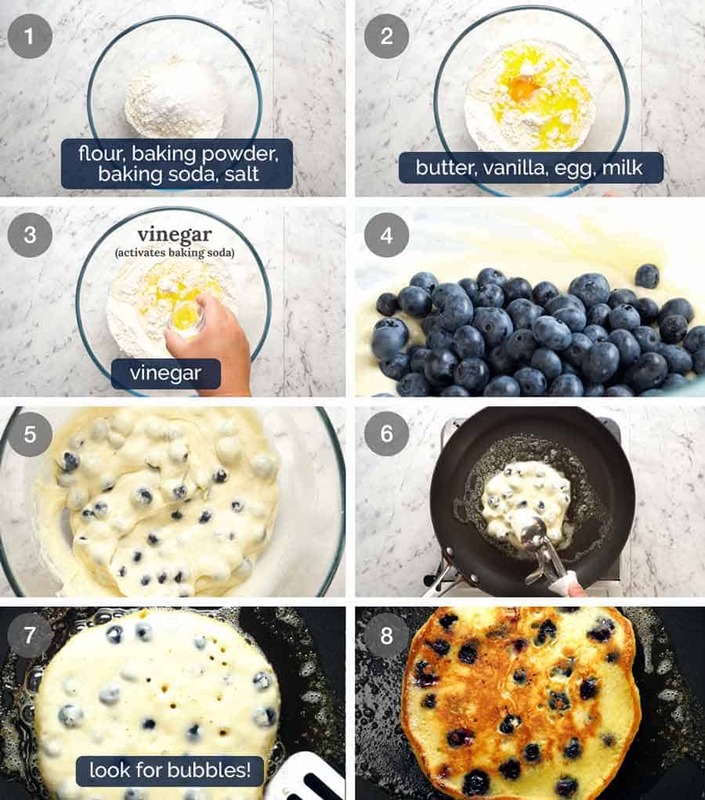 Mix, add blueberries, dollop, watch for bubbles, flip. 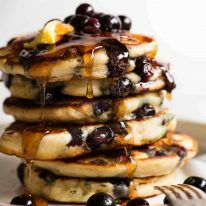 Can I make Blueberry Pancakes with frozen blueberries? YES! Works perfectly. Do not thaw and minimise stirring (otherwise it bleeds and can discolour the batter). Get two pans going. You got this! To avoid the need to keep the blueberry pancakes warm in the oven, I like to get two pans going. But if you prefer to stick to the leisurely approach and use one pan, just keep the cooked ones warm in the oven on a rack (this stops the bottom of the pancakes from sweating and going soggy). Do not stack them in the oven – you’ll squish the ones at the bottom!!! Blueberries, like all berries, are packed with antioxidants and Vitamin C. They are often called a superfood for their many health-promoting benefits. Studies suggest blueberries may help improve skin, bone and circulation when eaten as part of a balanced, healthy diet. Recipe video above. 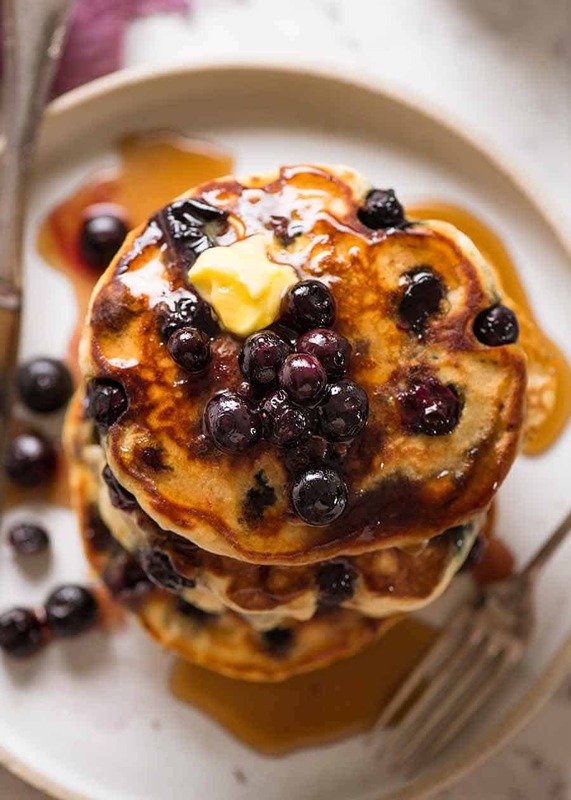 Extra soft and fluffy Blueberry Pancakes! The secret is baking soda (also known as bi carbonate soda) and vinegar (which activates the baking soda). Don't worry, you can't taste it! Use fresh or frozen blueberries (not thawed). Add Wet ingredients, whisk until just incorporated. Stir through blueberries. Melt about 1 tsp butter in a non stick skillet over medium high heat (medium if strong stove). Cook for 1 1/2 minutes until a few bubbles appear and underside is mostly golden. Flip with confidence. Cook a further 1 minute - poke centre, should spring back, underside should be golden. Repeat with remaining batter, using extra butter as required. 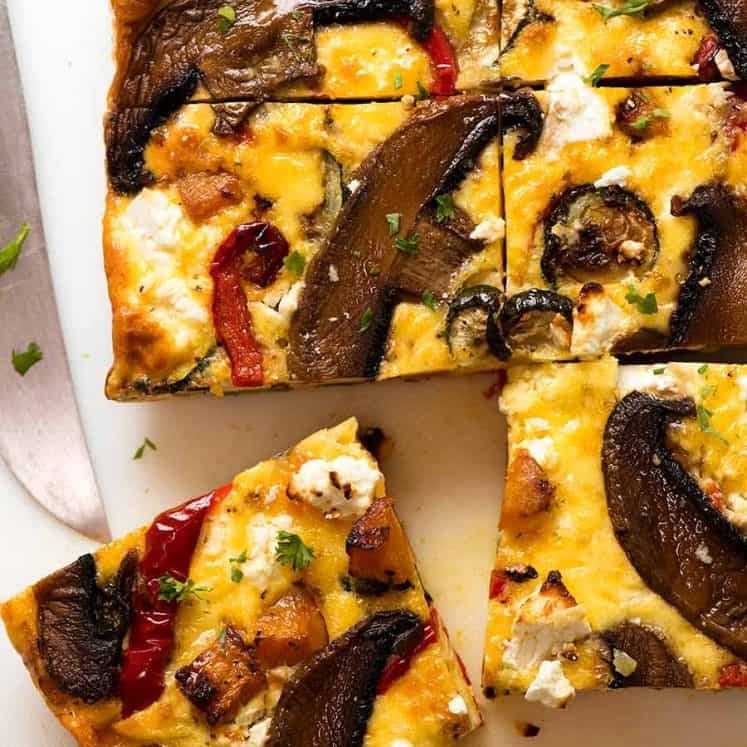 Serve with copious amounts of maple syrup and softened butter. Blueberries come in 125g punnet here Down Under, so I use about 1 1/2 punnets. I toss the leftovers into the pan to warm through them add them onto the stack. Alternatives: Other small frozen or fresh berries, or chocolate or other chips! 4. Ice cream scooper with lever is ideal here, standard size is 1/4 cup! - These are not too sweet because the assumption is that they're doused with maple syrup! - Fluffy but not crazy thick. Too thick and it's too "bready". We want soft and fluffy! - Do not leave batter sitting around - the rising power will dissipate. Hi Nagi,can I use bluberryfilling instead,if so how much would that be. I just made it for brekkie this morning. Frozen blueberries did bleed quite a bit so the presentation wasn’t the best. However, the consistency was great, and it tasted absolutely delicious, one of best pancake recipes I have got for sure. Looks like I have to make it every week now. Thank you, Nagi. I normally don’t like thick pancakes and I use Nigella Lawson’s recipe but everything I have made of yours has been excellent so I made these this morning. Another great recipe from Nagi! Wahoo! I’m so glad you tried them! These are excellent pancakes. I made them five weeks ago and my mom has requested them every weekend since. (I am also very smitten with them). They have officially become a weekend tradition! My husband loves pancakes !!! I’ve tried several different recipes but none satisfied the king ! I didn’t have the blueberries but decided to make these anyway. Wow ! If you haven’t tried these you have to. 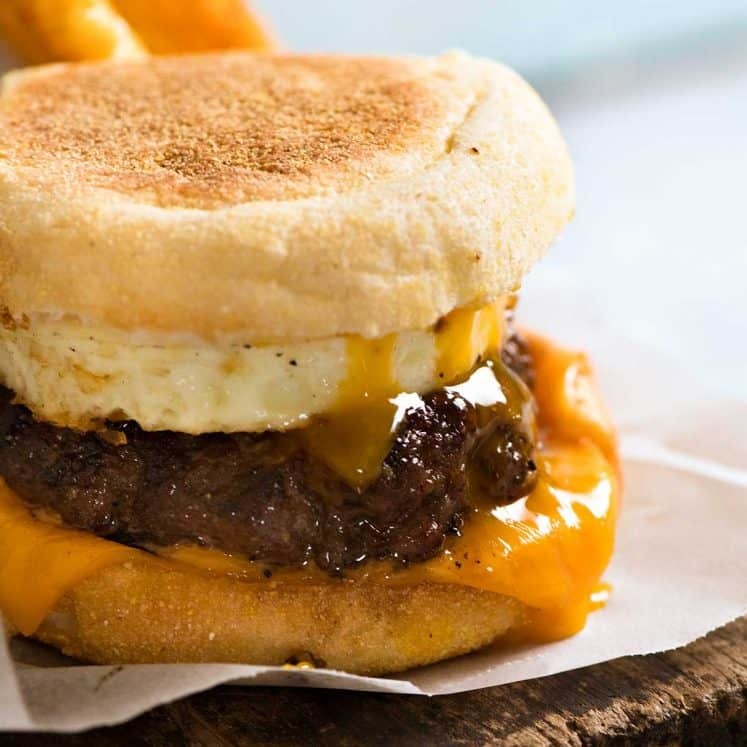 Fluffy and delicious. My husband said don’t lose this recipe and throw out the others. I have regained my position as Queen ! Thank you Nagi, hugs to Dozer. Also thank you for your additional notes, for those of us that aren’t great cooks your notes are quite helpful. You’re so welcome Betty, thanks for letting me know what you think! I made these this morning and they were sooo good! Really easy, one bowl and tasted amazing, got so many complements! Thanks Nagi! Yessss! This makes me so happy! Hi, I just made these pancakes for dinner. They looked so good i could not help myself. I follwed the recipe exact and they came out lovely. I used frozen blueberries, I did not mix them into the batter but I put the blueberries directly into the scoop thus my batter did not turn blue. It looked like Nagi’s own in the pic. Thanks again Nagi for another wonderful recipe. It is the first time I put baking soda and vinegar. Great addition to my pancake making. Woah great tip Leisel!! I’m so happy you loved them! 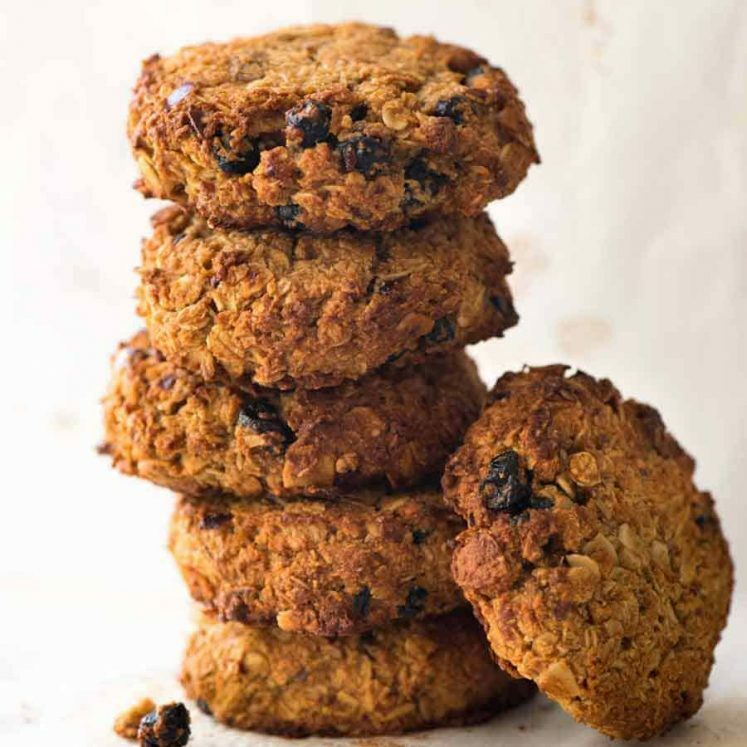 I made these for breakfast and they were delicious! We are having a huge winter storm here in the States, and I have a recipetin weekend planned. Beef stew for dinner and your vanilla sponge cake for desert. My husband is ecstatic! I will let you know how it all turns out. Woah that’s awesome!! Love to know how it goes – keep me updated Cheryl and stay warm! I put comments in the specific recopies, but I wanted to tell you that I had so much fun making these! Except that I think I did the dished 5 times that day! Thanks again! Woah that’s great to know Julia!! I made these this morning and they were great. I have to do gluten free so I used 2/3 Buckwheat Flour (yes – it is gluten free in spite of the name) and 1/3 Sorghum Flour. 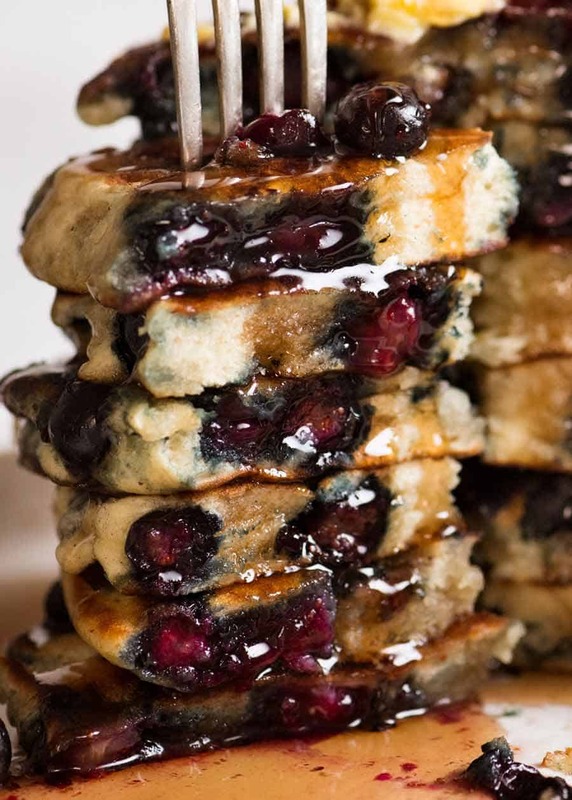 I never added so many blueberries to blueberry pancakes but these are the way to go. Awesome to know about the gluten free flour as I’m sure people will ask, thanks so much Lee! Not sure why but I had a few problems with these. Firstly the frozen blueberries I used made the batter go purple despite minimal stirring. Secondly despite refusing the blueberry content they were very hard to keep together and flip. I could also taste the baking powder. Hi Magda, I’m so sorry you didn’t have much luck with these! Can I ask what baking powder you used?